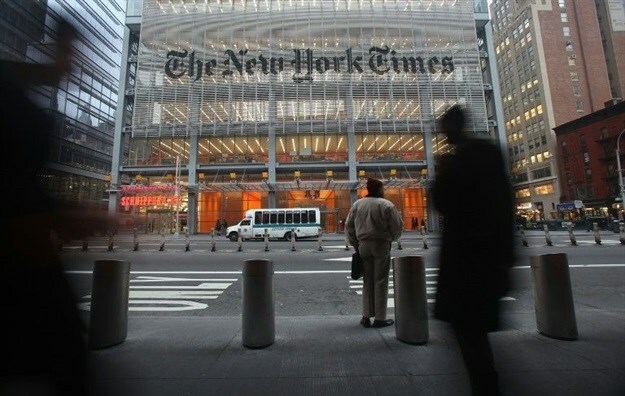 NEW YORK - The New York Times Co. said on Thursday gains in paid digital subscriptions and stronger online advertising revenues helped the newspaper swing to profit in the second quarter. The prestigious daily, which has been gaining subscribers even as it is branded as "failing" by President Donald Trump, reported a profit of $15.6 million in the quarter, compared with a loss of $211,000 a year earlier. The report showed the Times appearing to make progress in its strategy of emphasizing digital as print readership declines. Overall revenue rose 14 percent to $250 million, fueled by gains in subscriptions. Paid digital-only subscriptions rose by 114,000 from the prior quarter to 2.3 million and were up 63 percent from a year ago, the newspaper said. Digital advertising revenues increased 22.5 percent from a year earlier to $55 million and accounted for 42 percent of total ad revenues. That helped offset a 10.5 percent drop in print advertising revenue. "We had another strong quarter in which we grew revenue and profitability and made significant changes within the organization to ensure that the acceleration of our digital business continues in the long term," said Mark Thompson, president and chief executive. "We believe that more and more people are prepared to pay for high quality in-depth journalism that helps them make sense of the world." Like many media organizations, the Times has been struggling to keep momentum as readers turn to online news sources, including platforms developed by internet giants like Facebook and Google. The Times earlier this year began offering buyouts to its newsroom employees in a move aimed at eliminating multiple layers of editing, to focus more on reporting.